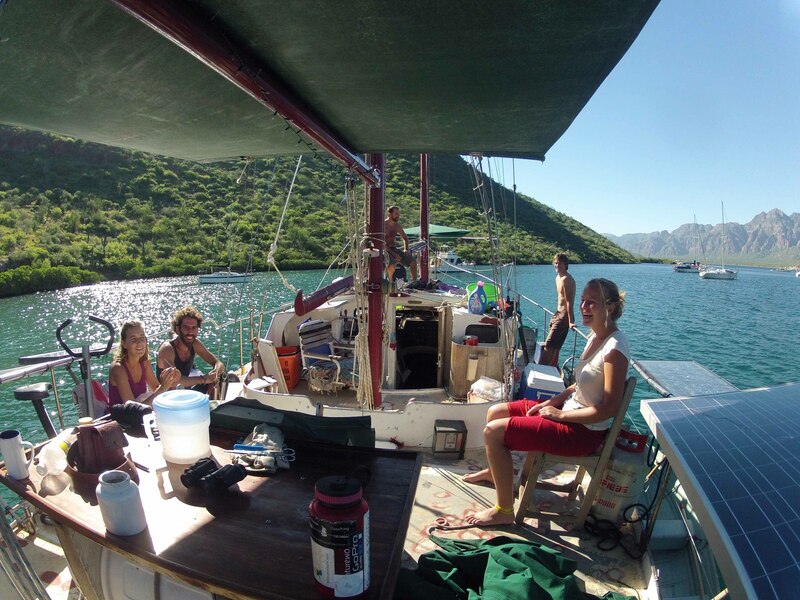 Back on Karaka – Puerto Escondido, Baja California Sur Mexico! After a great adventure in Mexico City and the rural mountains between Mexico City and Valle de Bravo, a few days with friends and families of friends in Valle de Bravo and Mexico City I have made it to my destination in Puerto Escondido, Baja California Sur, Mexico meeting up with my good friends Tom and Kim and crew on the 53ft ketch Karaka! I spent a few days with my friend Eduardo Ysla’s lovely family in La Paz testing out some different kayaks and teaching them some of the basics, sippin coconuts, and enjoying the hot baja sun! the Ysla family was so good to me, feeding me so well and helping me get everything done i needed to for the few days i was in La Paz. So i ended deciding on buying a 14ft kayak, a Necky Zoar, older plastic model made in Canada. A decent boat for a decent price $6,000 pesos ($465). I tried to see if it would fit on the bus to Puerto Escondido yesterday but unfortunately it did not work out so it will rest safe in La Paz until we arrive the mid to end of November. Very sad but we still got a little sit on top here to enjoy! So for now we got a full crew, myself, Tom, Kim, Stephen from San Diego who motorbiked down here, Eric from Chilliwack, BC in Canada and two folks from Argentina Estaban and Carola. We are preparing to head north in the Sea of Cortez for the next few weeks before we turn around and head south to La Paz to swap out some crew and provision for the pacific! This entry was posted in Sailing, Sea Kayaking and tagged Baja California Sur, karaka, ketch karaka, Mexico, puerto escondido, Sailing by zkruz. Bookmark the permalink.